I got another guest correct! 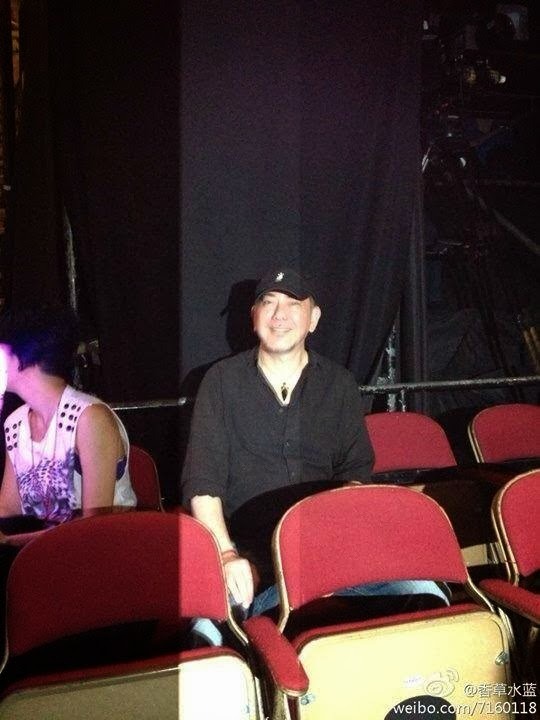 But when I first saw him in the audience, I thought it would be somebody else. 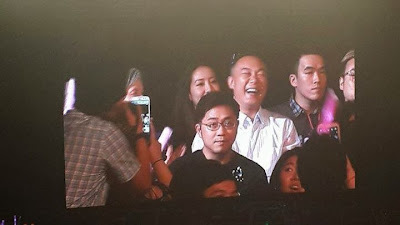 However, I should have known, 'cos Kenny Bee was also in the audience the previous night and he had been the guest. And Eason and Jay have been good friends for many years. Jay has written a song for Eason....more on that later. The final show on 22 September was moved forward to 2PM, instead of 8PM, due to the typhoon alert as Usagi was bearing down towards Hongkong and China. However, strong winds and rain did not dampen the spirits of the fans nor Jay, who decided that the final show just had to go on, no matter what and in the highest spirits possible. Jay: We must be very HIGH today to blow away the typhoon, okay? I hope the weather will be fine as long as I am around. Jay: Are you guys scared of today's typhoon? Actually, I'm very afraid; that the concert cannot go on and also worried about everyone's safety. That's why we beat the typhoon and started in the afternoon. Will we be as HIGH?? I just love his bantering with the fans! And soon, it was time for the guest to appear! Eason popped up on stage from behind, telling Jay he had been waiting for a long time and was getting anxious. Also....couldn't he have climbed up from the front?? More translations below the link. 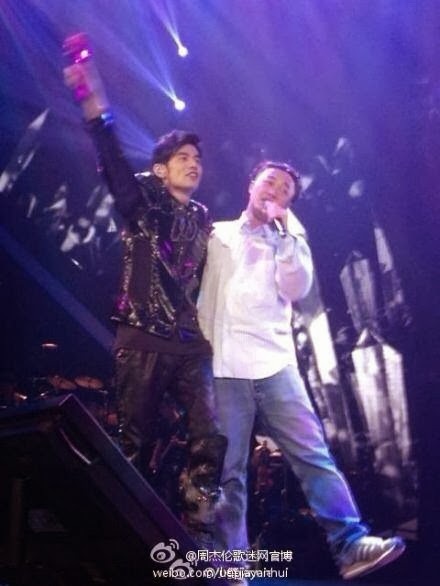 They sang two songs together...first the one and only Cantonese song which Jay had practised very hard for this concert and then the song he had written for Eason a few years ago. E: I wasn't sure if I was supposed to sing from my seat or on stage. J: No, of course not. You must be on stage. E: Your Cantonese is now quite good! J: Move here? But property is very expensive here. E: I have an extra room in my house. You can stay next to my daughter. I also have a very large garage...let's not talk about all this nonsense. Thank you for coming to Hongkong. Jay called me one day whilst I was driving, saying he wanted very much to sing a song. 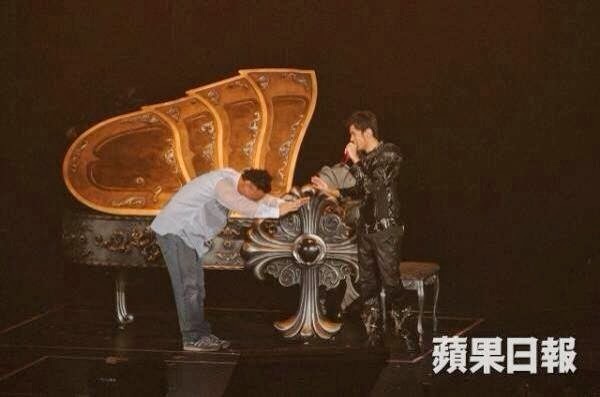 I ws a little worried about him because he has all these ideas and he said he had to sing a Cantonese song. It was not a song he is familiar with, And he has been practising very hard for our sake. As for his abs, there's nothing else to say. I wore see-through sleeves today to match you; I'm old; I don't have the mermaid line. The lines on my head are more than yours. E: He really worked very hard for this concert. E: Look forward to your next time here. J: Not so fast; we cannot end so quickly. Not enough. E: Hey! I'm afraid you don't have transport home. And my hotel is very near. The piano is here for you. We have to sing one song to make this a perfect occasion. I have a story which I must tell. 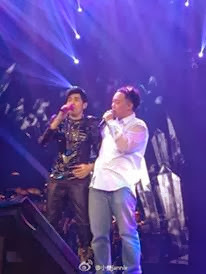 Usually, other singers ask me for a song and I'll check with Vincent as to whether to do it. But Eason was different. I offered to write him a song; and not only did I compose it, I also wrote the lyrics. Because Vincent is always busy. So I said no matter, I will write this one for him (Eason). Eason was so cute and friendly, putting his arms around Jay whilst singing, that it really warmed my heart when I saw how comfortable Jay was with him. They were so funny at the end, with Jay calling out "EASON!" 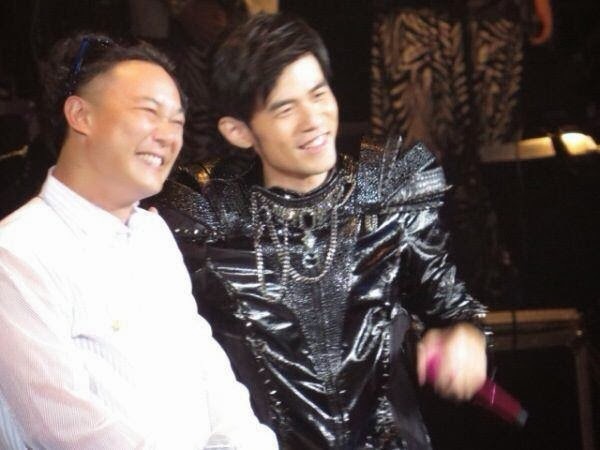 and Eason responding "JAY CHOU! ", in that American way...lol! Here are some nice pics. 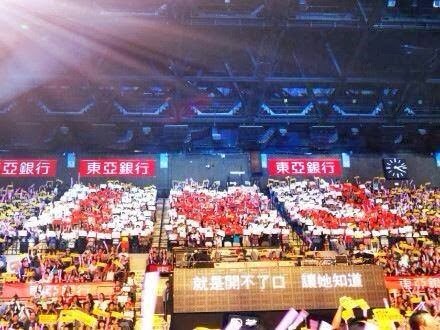 Just look at that pattern which the HK fans prepared for Jay! In the end, Typhoon Usagi spared Hongkong! Oops! What was I thinking?? ?